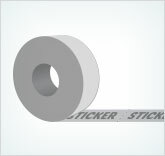 Stickers on a roll are available in clear/no colour, two colour or full colour. They can include your logo, text, or any other information you would like to include. The sky is the limit when it comes to your custom design! Stickers on a roll are perfect for packaging, marketing, or for handing out as a promotional item to your customers. Stickers on a roll have a minimum order quantity of 250-500 pieces per design, and take approximately 7-10 business days to complete. We have many different materials and finishes available for your sticker printing needs. Contact one of our Service Coordinators today, to receive your zero obligation custom quotation!